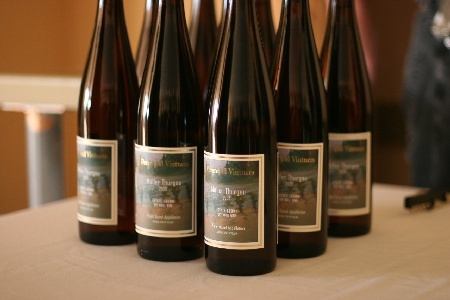 Each year, local wine dynamo David LeClaire puts on an event entitled The Northwest Boutique Winery Showcase. It's a fun and informal winettasting intended to help show off the newest small producers in the area. Perennial Vintners attended in 2007. We had a wonderful time meeting folks from other wineries, making lots of industry connections, and best of all, getting great comments from people! 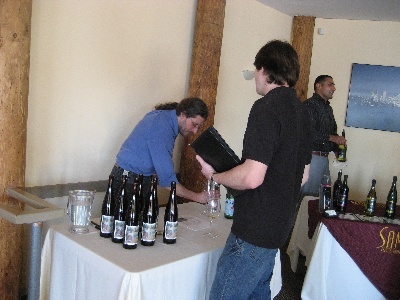 (Left to right) MikeL blue shirt behind table, black shirt back to us is Randall of NW Enology, and rightmost is the fellow from Samson Estate Winery.